Wayfair, one of the world’s largest online destinations for the home is bringing you an exciting photo competition celebrating our furry friends and what they get up to — both the good and the bad! 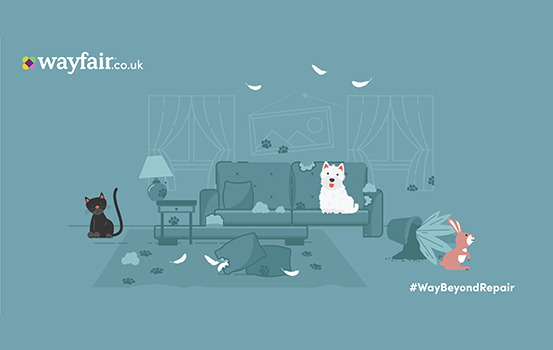 All participants need to do to enter is visit the Wayfair competition page, and submit an image of their pet as well as furniture that they’ve destroyed or made #WayBeyondRepair. The lucky winner will receive a £500 Wayfair gift card to use towards buying a similar replacement item of furniture, or another item for your home. There is no limit on the number of submissions, so keep the photos coming! What’s more is your pet can have their own chance at stardom, by being featured on their competition page for all to see. If you don’t have a naughty pet then still check out the #WayBeyondRepair photo gallery, which you can access from the link below, to get your daily fix of cute pet pics! Competition closes on September 21, and the winner will be notified on Friday October 5, 2018! ENTER NOW for a chance to WIN — we wish you the best of luck!